Home | Discount Leotards ™ > Grips, Grip Bags, Balm, Etc. > Bailie hook and loop ladies uneven bar grips with removable neoprene insert (1 pair). Regular (302W) or narrow (301N) width. Bailie hook and loop ladies uneven bar grips with removable neoprene insert (1 pair). Regular (302W) or narrow (301N) width. 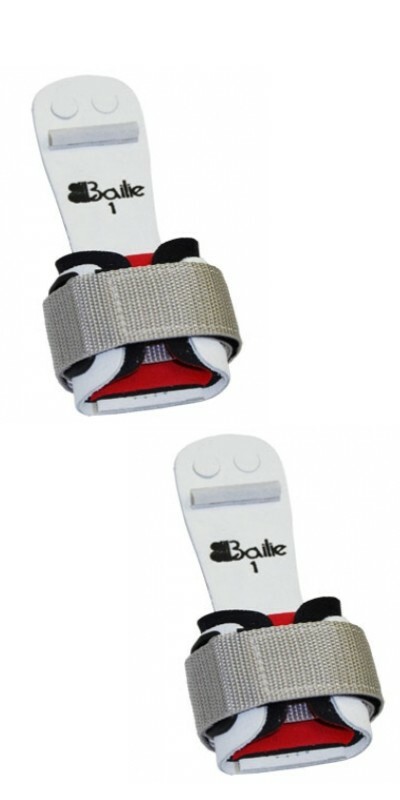 Bailie women's dowel grip - regular or narrow width, neoprene. Bailie's standard and most popular grip. Includes a one and half inch hook and loop strap and a removable soft, neoprene wristguard. The dowel is glued and sewn onto the grip. Bailie - setting the standard! Made in the U.S.A.
Be sure grips fit properly before using!